There are things, people, moments, that mark a before and after in the stories. Milestones, as we know them. Art is particularly susceptible to these momentums. In the world of creativity it is important to know the technique and stick to certain standards, but when you decide to break with these schemes the results can be memorable. This was the case of great painters who used color, water and paper to express themselves in different and unexpected ways. These artists became milestones in themselves. When we look at the origins of these great artists, we can see that several share modest beginnings, even marked by tragedy or orphanage. 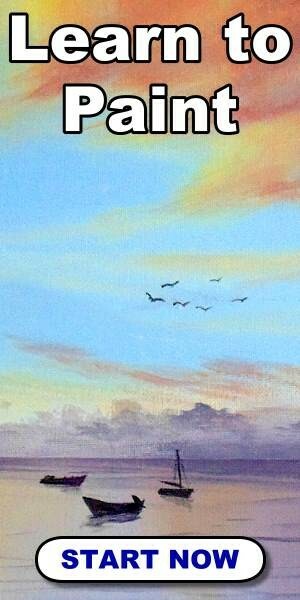 That did not prevent them from becoming, with passion and determination, great painters. Wassily Kandinsky (1866-1944), painter and graphic artist born in Russia, is considered one of the great masters of modern art, with important contributions in the so-called art for art, in pure art, and in abstract art. 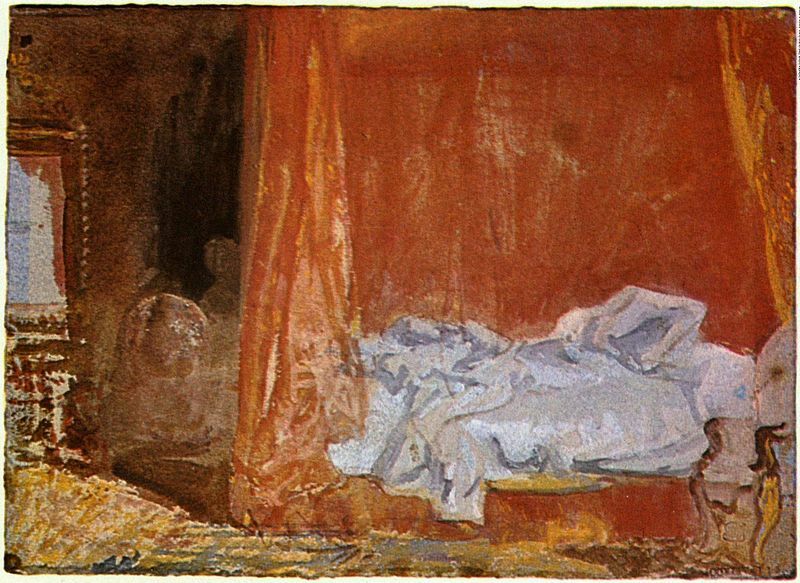 Watercolor was, of course, among the resources he used to create. In fact, the watercolor marked his entrance to recognition. 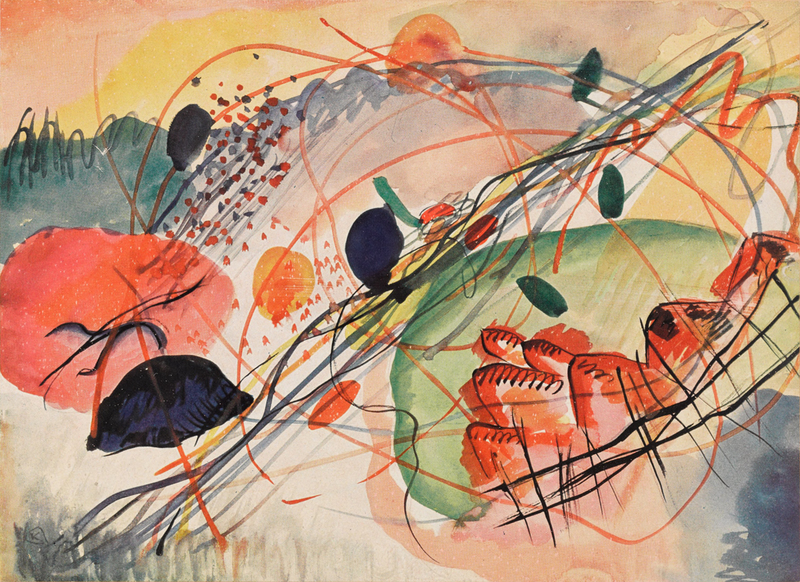 In 1910, Kandinsky left behind all conventions and painted an abstract watercolor, a work without a name: the first abstract aquarelle. Kandinsky saw in art a form of expression of his inner being. He did not like to copy nature; he rather used colors and forms to evoke emotional and spiritual reactions in those who contemplated his works. His vision of art was marked by how he related it to spirituality, and how he saw it as a vehicle to be able to transcend. The painter’s own life was an expression of rejection of conventions: graduated as a teacher, resigned to teach law to enter the art school in Munich, Germany. As part of his training, he became familiar with Expressionism, which had a great influence on his conception of art. The price to pay for being a pioneer in his way of making art was that several of his works were rejected in recognized exhibitions. In response, he mounted his exhibitions. Currently, his legacy is undeniable, and his name will forever be linked to the development of abstract expressionism. Rufino Tamayo (1899-1991), known as the painter who revolutionized Mexican art, and an icon himself, was an enthusiast of the intensity of the colors. It is also widely known for its murals, and for harmoniously combining pre-Hispanic Mexican roots and avant-garde artistic trends. His artistic production was quite broad. Among his works are 1,300 oil paintings, with a tender and important sentimental detail: 20 portraits of Olga, who was his wife for 57 years. To his credit, 465 graphic works include lithographs and mixographs, in addition to 350 drawings and 20 murals. He used to interpret reality from himself, from his inner vision, and so he represented it. The result was explosions of vivid shapes and colors that could evoke sensations and reactions beyond the borders of languages. His love for art led him to dedicate himself to it, without coming from a family of artists. In fact, his father was a carpenter and his mother a seamstress. Orphaned at an early age, he moved from his native Oaxaca to the Mexican capital, where he began his dedication to his passion. While living with his aunt in the capital city, he worked with her in the market. He grew up doing this: helping in the family’s small businesses, while he dedicated his free time to drawing and painting, and as soon as he could, he enrolled in the School of Fine Arts. An important lesson we can learn from Tamayo, for those of us who love drawing or painting, is practice and perseverance. He used to repeat that if drawing or painting is what you love, you have to do it daily, and as long as possible. The practice will lead you to excellence, and of course, we believe it, seeing the results he had. Joseph Mallord William Turner (1775-1851), the so-called “painter of light.” Of course, we cannot talk about revolutionary painters without including him in the list. The beauty of his works and the way his style took the aquarelle to a new level are undeniable. Many consider Turner the greatest English painter ever. His influence is undeniable, especially on watercolor and oil, two of his favorite techniques. In his first years of training he became interested in architecture and topographical drawing, and even worked with several famous architects of his time. Part of the beauty of Turner’s work is that you can see in it the vestiges of his times as a draftsman-topographer: his evolution from the clean and strict stroke to the freedom of creation that watercolor provides. The influence of his youthful interest in architecture is evident in his style. Landscapes and structure are among its themes, as well as scenes of maritime life. One of my favorite works is “Grenoble Bridge,” which Turner painted in 1824, based on sketches he drew when he visited America, 22 years earlier. Incredible, is not it? The painting presents a view of the bridge over the River Isère at Grenoble, now in Baltimore, United States, and is a masterful representation of objects, forms, people, and colors, which totally changes our vision. And, yes, it’s an aquarelle. But if you want a strong taste of this artist’s genius, I recommend that you see what his favorite work: “The Fighting Temeraire tugged to her Last Berth to be broken up” (1838), an oil painting was. Yes, I know, its beauty is overwhelming. If you want to continue your delight, you can look for the series of works by Turner that have as their theme landscapes of Venice. You will not regret. 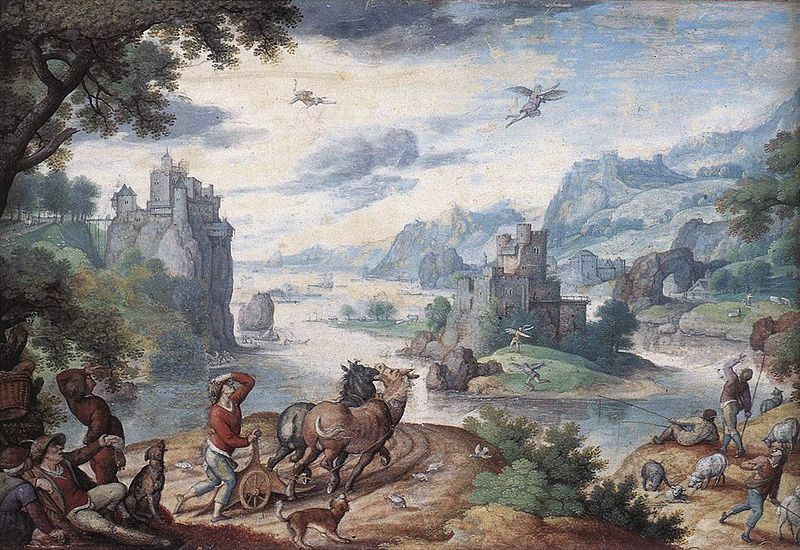 Now I want to tell you about Hans Bol (1534-1596), a German painter who was the founder of the first watercolor school in Europe. 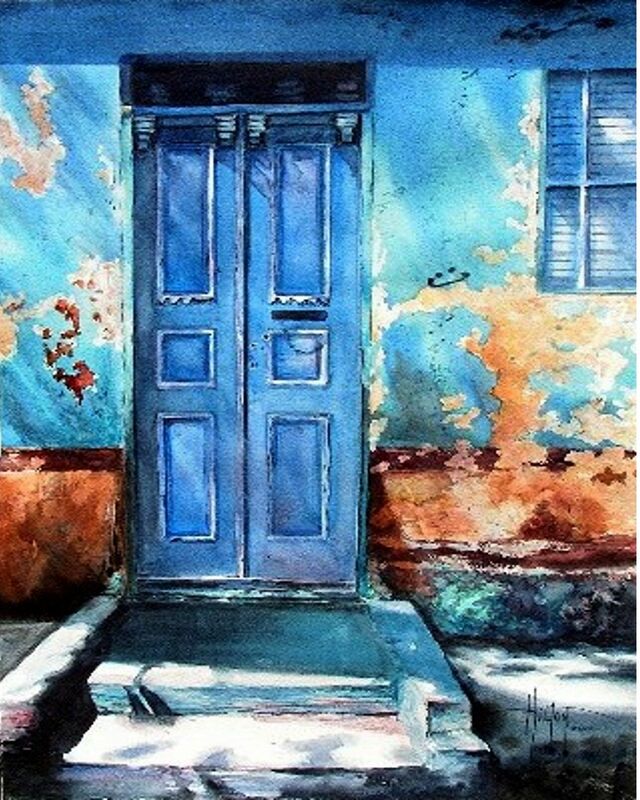 Bol’s work is proof of what many people say: that to be a good watercolorist. It is necessary, first, to master the art of drawing. I’m not sure if this is totally true, but you can appreciate how the work of a good draftsman when he starts using watercolor, becomes a piece of genius. Bol lived in an era in which watercolor paintings gained notoriety, especially for use in large format, because it was less expensive than oil. And, on the other hand, the miniatures were especially important. People used them to decorate books, manuscripts, and manifestos. The miniatures with allegorical, mythological or biblical themes gave the German painter great fame. If you do not know the work of Bol, I recommend you see “The fall of Icarus,” a watercolor on paper of just 133 x 206 mm. It is a plausible sample of what Bol did with the watercolor, exploiting to the maximum its potential of detail and color, and its application, quite lucrative at that time, to decorate manuscripts. 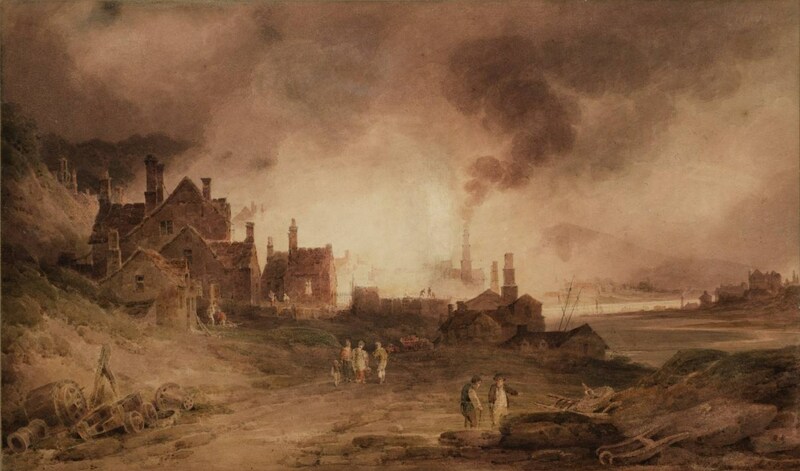 Paul Sandby (1731-1809), is the so-called father of British watercolor, and his story is one of my favorites. Besides being one of the founders of the Royal Academy, he worked a lot on prints, pieces that have always fascinated me. Why do I like this artist so much? First, because of his origins: he went from being a map-maker to a painter, mainly using watercolors, with wonderful results. I recommend you to see two of his most famous works: Pembroke Castle (1808) and Valle Crucis Abbey (1780). In a more classic, realistic style, a classic realism, if you want to call it that, it portrays two moments and transports the viewer to those places, those forms, those environments. His time as a map artist left him with the ease of the line, the precision of the line and the fluidity of the color. It is as if, after portraying the world from space, he decided to give us much closer and welcoming approaches. Another part of his legacy that I love is that he was something like the first traveling photographer: in his innumerable visits to different parts of the world, he made sketches and drawings of what he saw, from landscapes to monuments, which now serves for us as a testimony of how the world looked in those days. Ali Cavanaugh (1973) defines her work as “modern frescoes,” which is extremely curious since the frescoes are considered the precursors of watercolor paintings. 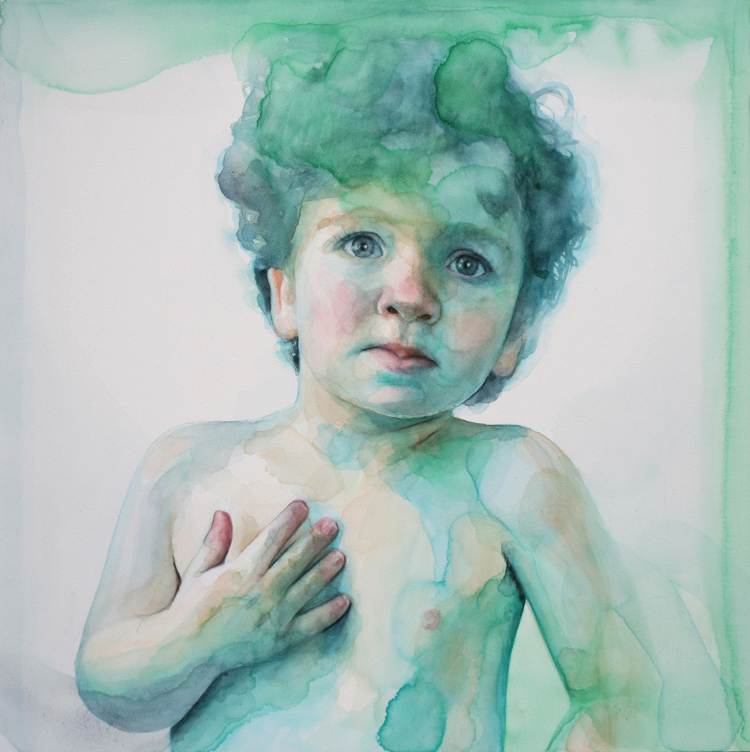 I have included this North American artist on our list because it is important to see how young painters are revolutionizing watercolor in their way. In the same way that classical artists set milestones and revolutionized the way we use and appreciate watercolors, this girl leaves us speechless with her portraits. Cavanaugh uses a washing technique in many of these portraits: the impeccable strokes that give shape to the faces and expression to the eyes combine with water and color spots, in wonderful harmony. 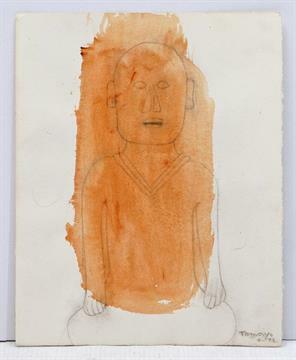 The stain in this washed technique adopts an organic tone, without style or form, superimposed on the others, equally distributed randomly on paper, and gives it a sense of life that makes his works special. His strokes have decorated covers of the New York Times magazine, American Artist Watercolor and Time, among others. She also maintains her website where you can appreciate her works, such as “Seeing through to you,” one of his portraits that I like the most. The contrasting effect between the hyperrealism of her characters’ factions, and the water and color stains are part of her stamp, although she also has realistic pieces that you might well mistake for studio photographs. Among his favorite motifs are the human figure and the faces of children, alone or together. He has also mastered monochromatic watercolor masterfully. Phil Hilton is a modern impressionist. He says that he began painting quite young, using first oils and then acrylics, but after trying watercolors, in 1976, this technique has become his life. He maintains a website where his work can be appreciated, which he defines as realistic. Hilton is passionate about learning and teaching: he always reiterates the contribution that his multiple teachers have left for him, and dedicates a large part of his life, a quarter of a century in the account, to teaching others. In fact, he wrote and published a watercolor manual for beginners, which is currently available in several online bookstores. His themes are varied and versatile, from landscapes to everyday scenes of children playing on a street. The animals also appear a lot in his work, as well as plants of all kinds. As for Hilton, one piece that I love is “Montana Trout Haven,” which presents a small waterfall in the middle of the forest, with impeccable use of contrast, light, and color. And while he has highly realistic paintings, if you see his work and you look at the way he represents still life and pots with flowers, you will see that he is also an impressionist. One that delights us with his good taste, and his harmonious use of color. Up to here comes our journey through the stories of some of the great watercolorists of the world, from ancient times to the present day. What do you think? Did they inspire you? It is time, then, to take the pencil, brush, paper, and watercolors, and start doing your own thing.